This picture is of the veggies on the baking sheet for a reason. I use a few techniques to achieve roasted vegetables that are golden brown and full of flavor yet still slightly firm. And it starts with the tray! When roasting vegetables, the side touching the tray will brown first. So, as I mention in the recipe below, it is preferable to have as much surface area touching the tray as possible. I take a moment to put the flattest, cut side down. Also, you want enough oil to prevent sticking and lightly coat the veggies. Too much oil can make them soggy. I like to liberally coat the tray and then flip the vegetables so there is just enough oil to make any seasonings stick. Typically, I roast vegetables at 425 degrees and start with about 20 minutes, then peek underneath to check for that caramelized, crusty look that means they are going to taste great. If they aren’t ready, bake in 5-minute increments until they are golden and just tender. At 425 degrees, a lot of browning can happen in five minutes and you don’t want them to burn! Also, keeping the veggies to a single layer is going to ensure they receive the all-important contact with the baking sheet, where the browning happens. 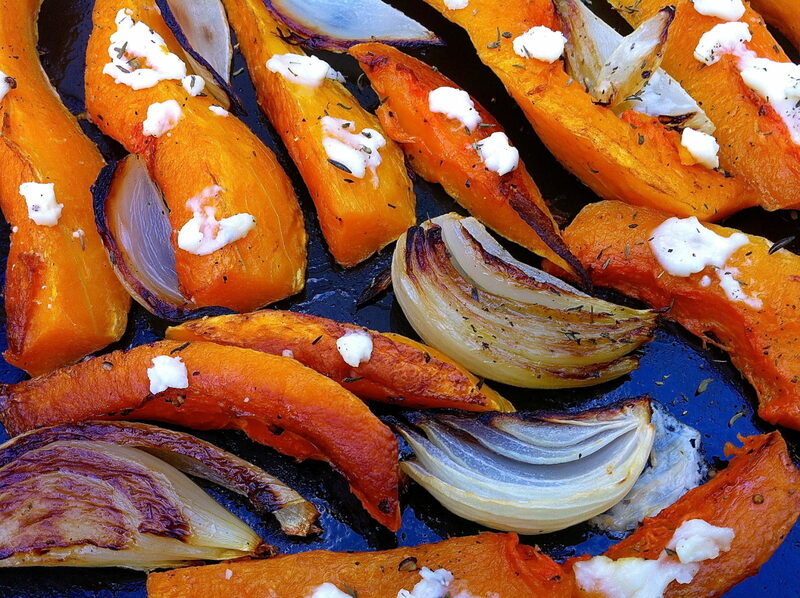 If you have a lot of vegetables, using a second baking sheet is helpful. If I am roasting very small vegetables that I want to quickly brown before they get too soft, I will usually increase the heat to 450 degrees and start with about 15 minutes. I did this the other night with very small patty pan squash. Conversely, if I am roasting a denser vegetable that requires more cooking time, like potatoes, I will reduce the heat to 400 degrees so that they don’t burn before they are cooked through. In general, 425 is a happy medium and if you see the bottoms getting too brown before the vegetables are cooked through, simply flip them so the browned side is no longer touching the tray. Successfully roasting all sorts of veggies will not only give you a delicious side, it will provide flavorful leftovers that can be used in a salad, tossed with rice or quinoa, or topped with an egg–just to name a few ideas–for an easy dinner later in the week. If you have any questions about the technique, please don’t hesitate to email me or ask a question in the comment section below. The feta cheese will not melt but will get slightly browned and will provide a salty kick to the sweetness of the butternut squash. Any feta bits that land on the baking sheet will get crusty and golden and can be scraped off the tray and enjoyed! Preheat the oven to 425 degrees and liberally coat a baking sheet with olive oil. Place the vegetables on the baking sheet then flip so that both sides are lightly coated in the oil and the flattest part of the vegetable is touching the tray. Bake for 20 minutes, then peek under the squash and the onion slices to see if the bottoms are golden brown. If they are not, roast in 5-minute increments, checking for a nice bit of golden brown. When they are golden and just tender, remove from the oven, change the oven setting to broil, and sprinkle the squash and onions with the feta cheese. Broil for 1-2 minutes, watching closely, or until the feta is starting to brown. Remove from oven and sprinkle with chopped fresh thyme, if desired. My question is do you eat them this way or puree? We eat them this way, Ingrid. Butternut squash is delicious pureed and is very tasty this way, too. I actually like it slightly firm and a little crusty on the outside. Delicious!